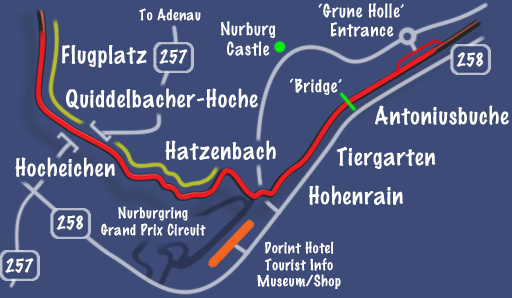 These pages are not intended as a track guide explaining how to drive the Nordschleife. Other sites and publications do that far better than I will ever be able to do. 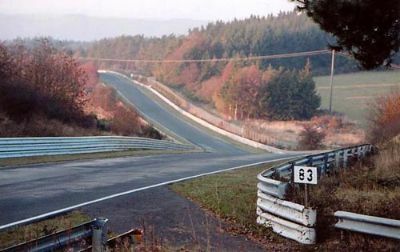 What it is is a photographic record of a lap, and as such it will show you views of this great track that you will not see when driving it. 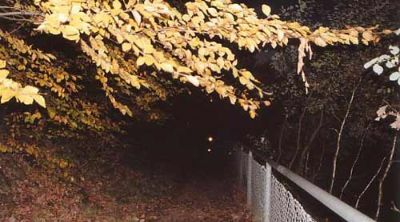 Its a beautiful area, particularly in the Autumn when most of these shots were taken. I will include my thoughts and impressions about driving the lap, but these are just that - my opinion and feelings from the 30 or so laps we have driven there so far. Cresting Eschbach and down towards Brunnchen. Some of these pictures are taken looking back up the track, as opposed to in the normal direction of travel - I shall indicate this by saying they are in REVERSE - to avoid any confusion! The best advice for driving the Ring I have heard is to drive it like a country road that you do not know as you begin to learn it. TAKE IT EASY! 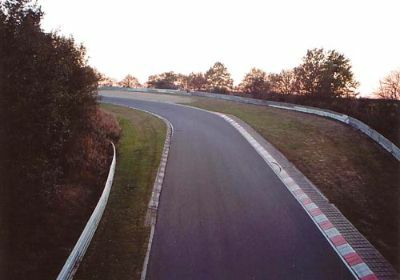 On our first ever track lap, which was at the Ring, we came off at Adenauer-Forst (as many people do) caught out by a rapidly tightening corner. Our terrible Michelin Pilot tires did not help, but we were lucky in that we came off at one of the few places on the track where there is the space to come off, and then rejoin the track, without actually hitting anything! Many many other people are not so lucky. 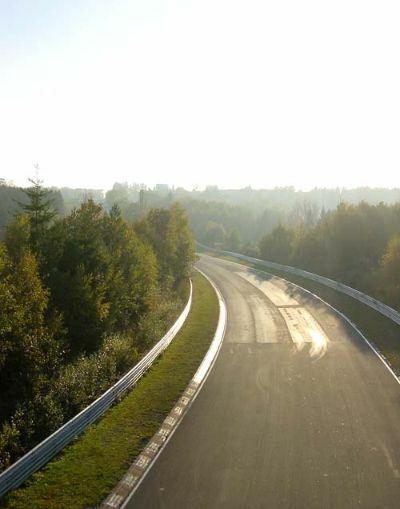 If you have an incident, you probably will not be insured, and you have to pay for any damage to the Ring (mainly Armco) as well as paying to be recovered from the track. 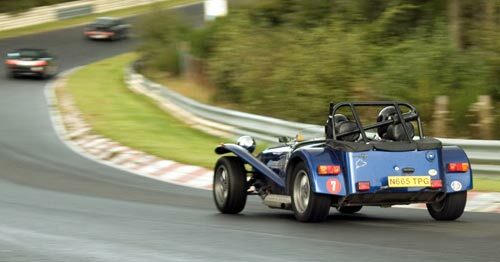 As an example of this, whilst we were at the Ring on October '03 one of the British Mini 2 cars went off at Hatzenbach. A pretty heavy impact set off the airbags and probably wrote off the car with extensive damage to the front. Apart from bruising no one was seriously hurt. However, to make things worse the car hit the Armco on the outside of the track, and then bounced across and hit the Armco on the inside as well. The driver was presented with a 1500 Euro bill before they would recover his car, to cover damage to the Armco and recovery back to the paddock for his uninsured (on the track) car. An expensive mistake. Exiting the Karussell and off up to Hoche Acht. 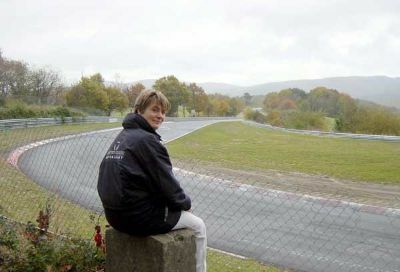 Tessa and I have mainly visited the circuit out of season, which has meant an almost empty track. There is no pressure to go quickly. 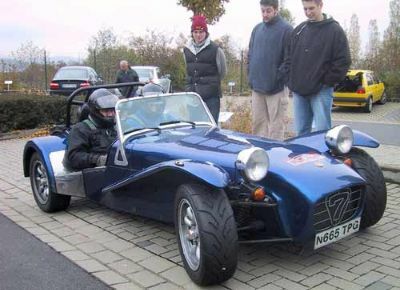 Just keep an eye out for faster cars approaching (like any track day) but do not spend the whole lap watching the rear view mirror - you need to keep an eye out in front of you as well for the coaches and mini buses (unlike most track days!) 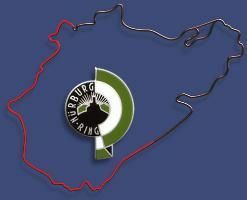 Once at the Ring, there is a telephone number which you should program into your mobile phone ( I will post it is I can find it) You should ring this in an emergency - I assume it goes to the 'Kiosk' at the entrance where they can co-ordinate what to do. To be honest my biggest fear when first driving thetrack was not us having an incident, but coming around a corner and being first on the scene at a nasty crash - be prepared. So far we have not seen a single incident or experienced a single stoppage in our visits, but just be aware. The maps you see at the top of each page, which I have created, show the section of the track that the page and pictures cover, and is shown in RED. The main corners are shown along with and any other information you might find useful, such as nearby public roads and access (WHITE). 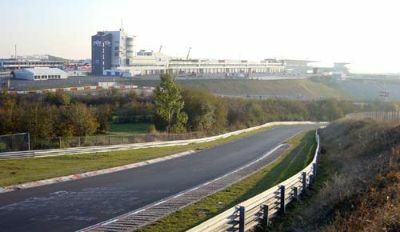 The YELLOW lines illustrate main areas where you can watch the action on the track. You can actually get right next to the track around 90% of the lap, and most of these pictures were taken whilst cycling along these tracks, but only themain areas are shown, which can be easily reached from car parks or main roads, such as at Brunnchen and Pflanzgarten. Right - onto the pics! The 'Grune Holle' Restaurant and entrance kiosk as seen from Nurburg Castle - your starting point. You do not have to wear helmets on public days. Common sense says you should. Make sure you (or preferably your passenger) has the ticket ready before approaching the barrier. Ticket goes in the slot, barrier rises - off you go! Just like a car park. Don't be surprised if you do not see any Marshals or officials. This is not a track day! 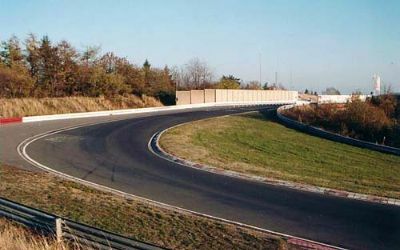 As soon as you pass through the barrier you may see people just pull off to the right - by the Armco in front of the Ferrari in this picture. We had to do this so Tessa could re-tighten her seat belts after loosening them so she could reach the ticket machine. People also stop to wait for friends before driving off together. People also stop just around the corner after the cones and before the bridge. If you do stop here, make sure you are out of the way, and do not block the barriers obviously! Youare not allowed to stop anywhere once on the track proper. 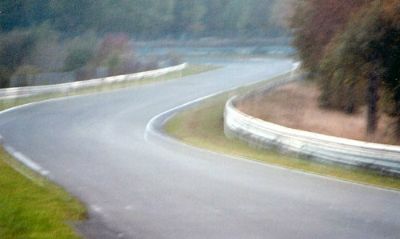 This reverse shot is taken from the bridge at Anoniusbuche, and is looking back along the huge Nordschleife straight. 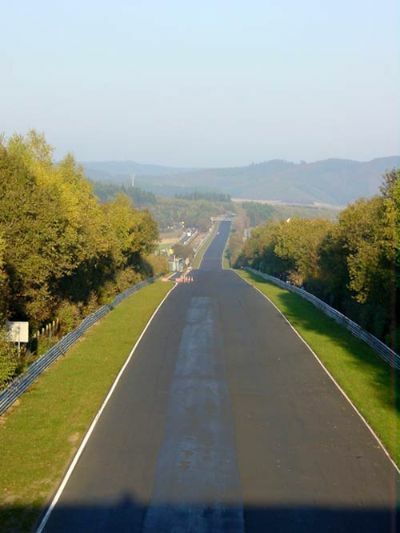 You can just about see the Gantry at Dottinger-Hohe, where you finish your lap later. You enter the track by the cones you can see on the left, and proceed under the bridge. If you do intend to time your lap, this is the bridge where you start timing on public days. 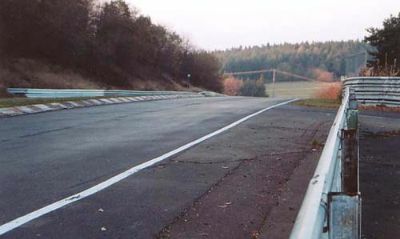 You do not complete a 100% loop, as you have to turn back into the entrance paddock at the end of the lap, so a representative lap is commonly timed 'Bridge to Gantry' - the Gantry just about being visible at the start of this long straight in the distance. The track sweeps under the bridge and down into a dip at Tiergarten, before sweeping up again at Hohenrain. 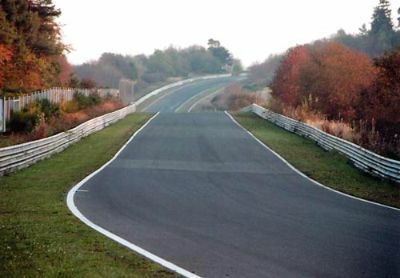 It is here that you turn along the new GP track (assuming it is a public day) and bear off to the right, down onto the Norschleife 'proper'. It is quite a tight turn. I almost lost it here trying to get out of the way of a rapidly approaching Ring Taxi! Reverse shot looking back to the short straight where you pass the end of the new circuit. 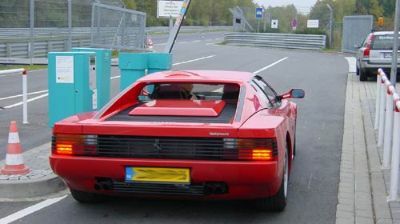 This left hander leads down into the 'Ring proper! 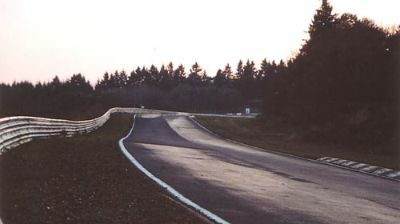 The left takes you onto this section of track, sweeping down past the new track and into the countryside and Hatzenbach. 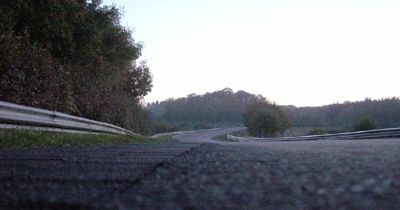 This is where the Mini 2 I mentioned had his incident, at the bottom of this hill on a fast right-hander. Reverse shot looking back at Hatzenbach. This twisty left, right, left, right etc section is a great intro to the track. Heavy camber really helps you here. 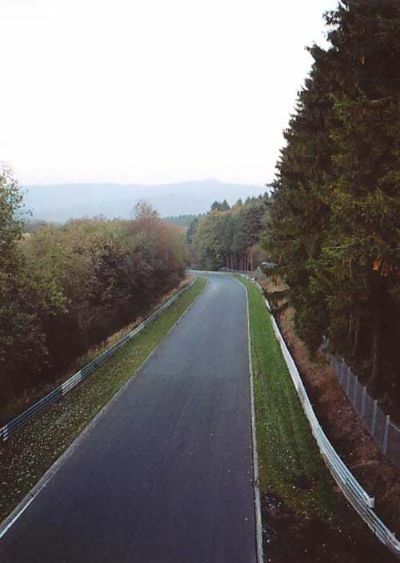 You sweep out of Hatzenbach and Hocheichen and down onto this 'relatively' straight section. The bridge over the 257 road is a significant jump! On through Quiddelbacher-Hohe and up to another jump into Flugplatz. Reverse shot looking back at the exit of Flugplatz. We could hear the rear wheels spin up as we came over the crest into Flugplatz. One of those corners that need confidence to keep your foot in after a few laps. 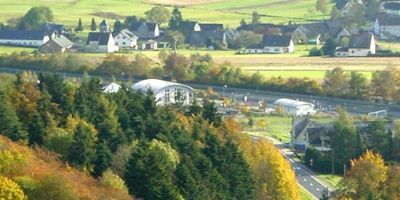 'Exit' of Flugplatz. Translated this means 'Flying place' - not because of the jump in the track, but because there used to be an airfield for gliders to the left of the track. 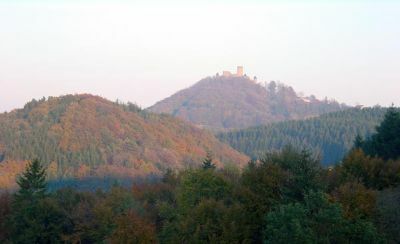 View from Flugplatz back towards Nurburg Castle. You can see this from most of the track - good way to get a sense of where you are in the countyside. After Flugplatz you sweep back down towards Schwedenkreuz. This is a flat out bit of track. Reverse shot looking back up towards Flugplatz from Schwedenkreuz. This is a very fast bit of track - a bump right on the crest you can see can unsettle the car through this very fast corner. 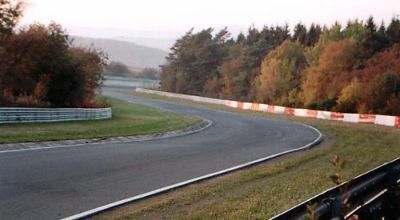 Through Schwedenkreuz here you sweep towards a hard brake for Aremberg, a tight righthander that is helped by a good camber. Reverse shot from the bridge here looking at the exit of Aremberg. One of the few comers with a gravel or sand trap, which you can just about see at the top of the picture. Looking over the other side of the bridge you can see the track swooping down steeply into the very fast Fuchsrohre - or 'Foxhole'. 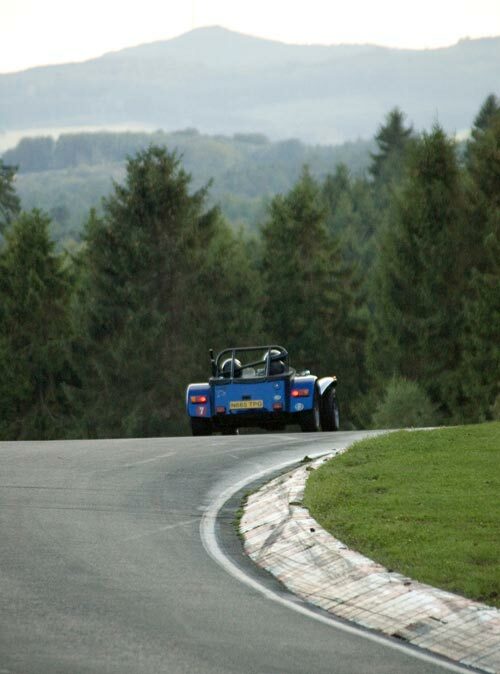 Although it can look twisty this section can be driven pretty straight - its very quick and a dip at the bottom may bottom out the car, before the track sweeps back up to the left, followed by a tighter right up into Adenauer Forst - which is a tricky little corner! There was no obvious trackside path at this point so we diverted into the forest here and followed the well defined paths. As we had actually started our bike lap at Adenau, we were now nearing the end of our bike lap, and it was beginning to get dark! This picture has been lightend in photoshop to show the type of countryside here. .....probably about here! It is a common beginners mistake, and because of this a popular spectators spot! 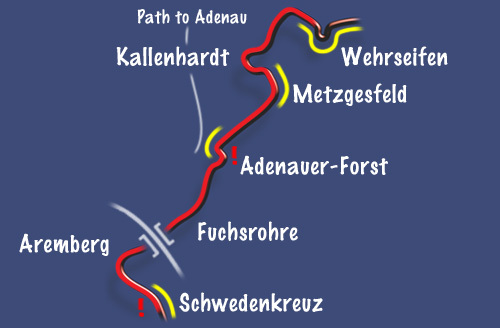 You reach this area by driving up through Adenau - turning left up off the main street and following a road that becomes a track. 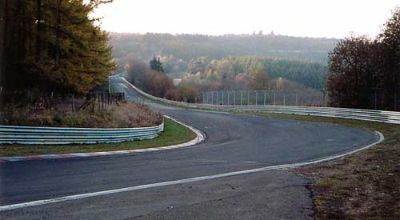 Adenauer Forst corner - enter fromthe right and exit left. 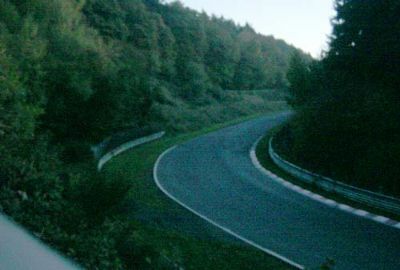 The pictures of Adenauer Forst corner were taken on a previous trip to the ring, when we were car spotting for new cars being tested - see our 'Scoops' section! The following pictures were taken in October, back on our cycle ride around the whole track. 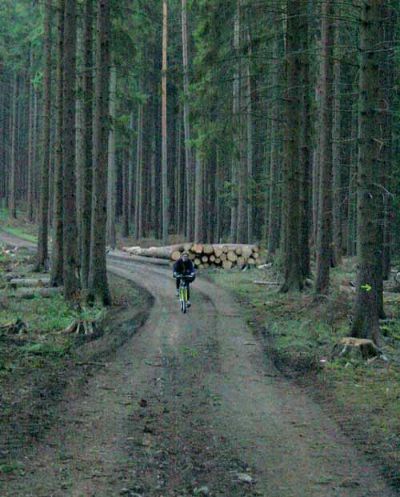 As we had started at Adenau, this was near the end of our ride, and the light was fading fast! The following pictures have all been heavily lightened in photoshop, but are not as clear as the others! Reverse shot looking back up towards the exit of Adenauer Forst. Behind me as I take this shot is the track sweeps into Metzgesfeld. Reverse shot looking back at Metzgesfeld. The left hander at the top of the screen is not as tight as it looks here and pretty quick. You can just see the Castle in the background. Left hander above flows directly into the right hander shown in this pic. I loved this bit - you really felt the car dig in and change direction before diving down towards Kallenhardt. Reverse shot which I think is looking back towards Kallenhardt! It was getting pretty dark by now, and also 'Kallenhardt' covers a few corners in this section! Reverse shot of the section after Kallenhardt. 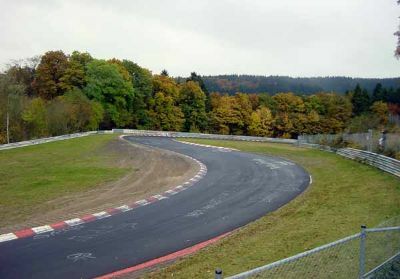 This is one of those Nordschleife sections that can blend into one, where each corner can look like the next - it takes a few laps to remember which is which, and is steeply downhill - fun in the damp! Assuming this was day light, this would be a lovely shot looking down over the small town of Adenau! But it was completely dark. This shot shows a very unimpressed Tessa cycling towards me in the pitch black, over a very rocky and uneven rough track. We could not see a thing! But at last we could see our hotel at the bottom of the hill. We had considered jumping down onto the track at this point to ride more smoothly and safely down to the hotel. Trouble was, we could not even see the track, let alone see a way onto it!